The UC Cooperative Extension conducted a preliminary evaluation of the reference evapotranspiration (ETo) values produced by the new Spatial CIMIS website from DWR. The purpose of this project was to compare how accurately the Spatial CIMIS values correlated to readings made at numerous locations using on-site ETo measurement devices. If the Spatial CIMIS data, which are generated by a complex modeling process, are shown to be close matches to values generated with local measurements, then this will provide a good deal more confidence to growers to use the Spatial CIMIS values. This would be an exceptionally powerful tool for growers, because it would allow them to utilize climate-based irrigation scheduling techniques without having to rely on ETo data from a distant weather station, or have to purchase their own expensive weather stations. Local ETo was measured at nine locations throughout the vineyard regions of Santa Barbara County using atmometers. These devices were in place during the summer of 2011, and their measurements were compared to the Spatial CIMIS estimates for the same locations. 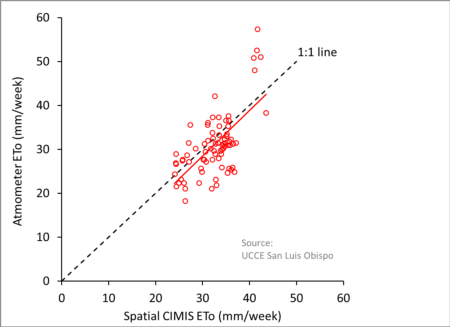 The weekly sums of ETo measured with both methods correlated quite closely, indicating that the Spatial CIMIS data has applications for irrigation scheduling in the area. Given these positive preliminary results, more extensive comparisons like this will be conducted in 2012.